I know we are past the very narrow window in which we consume pumpkin, but I have a belated recipe to share. 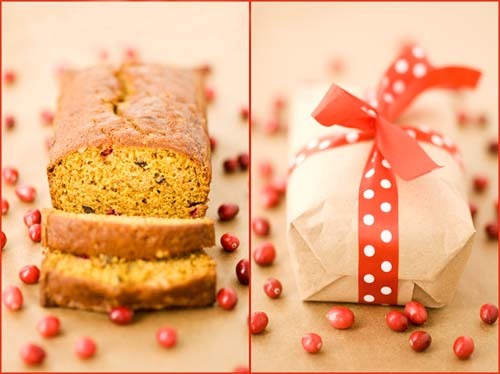 I thought it might be nice to make a pumpkin bread to give out on Thanksgiving for the next day, and found the answer to my recipe hunt on one of my favorite design blogs, Design*Sponge. In addition to all of the food blogs I avidly follow, there are a number of design blogs I check in on regularly and am always inspired by the fresh ideas and creativity I find. Design*Sponge is doing a weekly series called “In the Kitchen With . . .” in which a designer is interviewed and shares a recipe. A couple of weeks ago, Lena Corwin, an illustrator and textile designer, was featured and shared her mother’s recipe for pumpkin cranberry bread. I spotted it just in time to incorporate it into my Thanksgiving plans. I was initially a little dubious about the recipe as it contains more sugar than you probably care to think about and the raw batter tasted overly sweet. However, once baked, it contained the perfect amount of sweetness, and was moist and wonderful with beautiful flecks of cranberry and walnuts in it. On Thanksgiving, I sliced the loaf and wrapped the slices in polka dot tissue paper and then placed them in glassine bags tied with a bow – a very pretty giveaway and hopefully enjoyed the next day with fond memories of the holiday (don’t you love it when restaurants give you muffins for the morning after dinner?). I liked the recipe so much I had to make it again a few days later with the remnants of my annual bag of cranberries. This seems like a good time to share some of my favorite design blogs. I have them loaded into igoogle (LOVE!) where I can keep an eye on new posts and easily poke around. I am always amazed at the wonderful taste, style and ideas coming from these women. Be forewarned: if you haven’t visited these sites before you are likely to be drawn in for hours (especially if you explore their sidebar links and wander over to their flickr photos). Hope that you discover something new and find as much inspiration as I have. This recipe uses either two standard loaf pans (plus a small (5") cake or a few muffins), or three aluminum foil loaf pans. The foil pans make it easy to give the bread as gifts. Preheat oven to 350F/180C degrees. 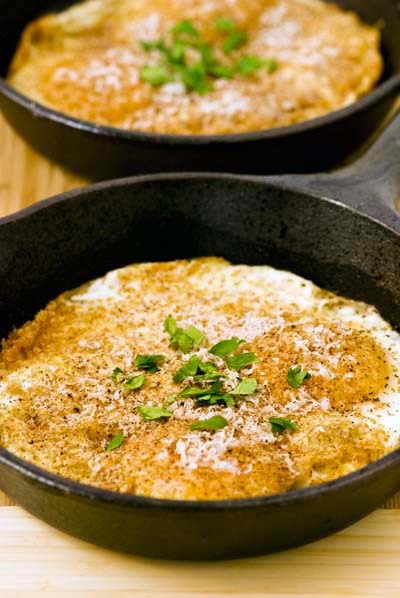 Combine the eggs, pumpkin, butter, and water in a large bowl. 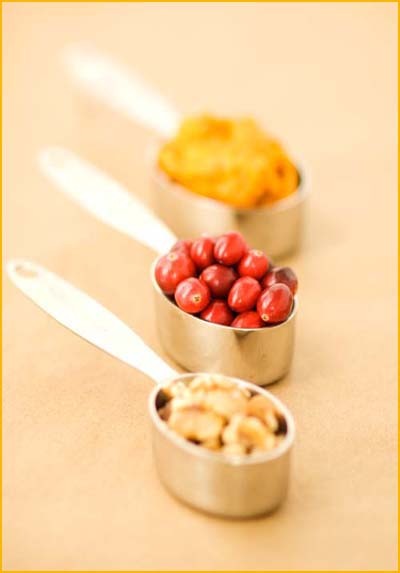 In another bowl, combine all of the dry ingredients, plus the nuts and cranberries. Add the dry ingredients to the wet, and mix with a wooden spoon by hand. Mix until the batter is combined, but don’t over mix. Grease the pans, and distribute the batter equally in the pans (should fill each about half way up). Bake for 1 hour. 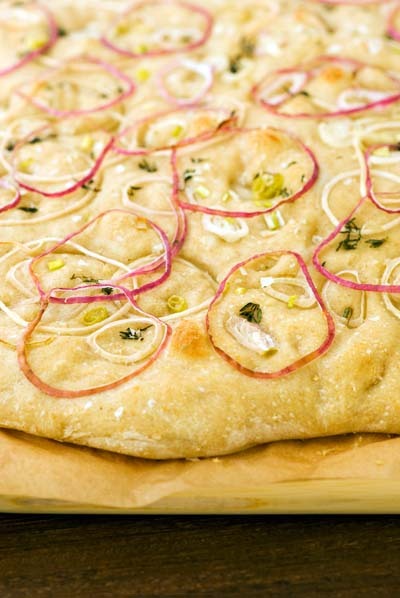 This weekend I tackled my second Daring Bakers challenge: focaccia. I was very excited when I found out about this month’s challenge. I’ve never made bread of any kind and I’ve been waiting for an excuse to give it a try. The recipe was chosen by Tanna of My Kitchen in Half Cups and is Tender Potato Bread (from Home Baking: The Artful Mix of Flour & Tradition Around the World by Jeffrey Alford and Naomi Duguid. 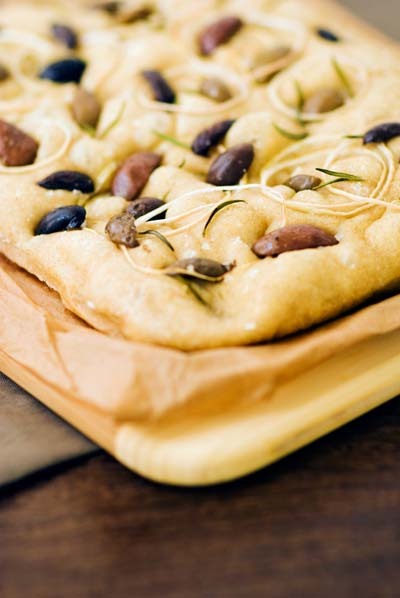 The bread can be formed into a loaf, rolls or focaccia, and I decided upon the latter since it is tasty and satisfying as a snack on its own, and afforded more creative topping possibilities (and what better excuse to sop up olive oil?). Bread is a little scary for the novice: unlike cake or pastry making there’s a lot of leeway in a bread recipe and a lot of judgment involved: the amount of flour that’s added is dependent upon the texture of the bread. The amount of time the bread takes to rise is affected by room temperature, humidity and even the draftiness of the room it’s made in. A good dough must be elastic but not too sticky and have just the right feel after kneading. A good bread baker must take all of these factors into account in the making of the dough. I don’t have any judgment or instinct on these matters having never made bread before, but luckily this recipe, plus learning from my fellow bakers’ experiences with the dough, made it possible to have a very successful first go-around. The dough is made by combining a mashed potato with the potato cooking water, flour (all-purpose and whole wheat), yeast and salt – unbelievably simple ingredients that turned into a wonderfully airy and tender bread. For the challenge, we were allowed to depart from the basic recipe by adding our own seasonings in addition to the recommended brushing of olive oil and sprinkling of sea salt on the top (and also allowed to form the dough however we wanted). I decided to split the dough in half and top one with Kalamata and assorted olives plus rosemary and yellow onion and top the other with yellow onions, red onions, shallots, scallions and fresh thyme. Both were delicious and I am looking forward to enjoying the spoils of my effort all week! As a word of encouragement if you are weary of bread: nearly everyone had a great experience with the bread and loved the end result. A few things I’d like to try next: I’d like to mix in caramelized onions or an onion confit into the batter so as to end up with an onion-filled bread (vs. solely topped) the next time. I’d also be more generous with the toppings that baked down more significantly than I was expecting. I also had a good learning: I ran out of time to bake the bread after I had let it rise and was able to form and refrigerate the bread (stopping it from rising) and then bring it to room temperature the next day, allow it to rise an additional ~20 minutes and then bake it. A very helpful learning since it’s hard to find the time to bake the bread in one sitting. I’ll definitely try this again. Thanks Tanna for a great experience! Potatoes and potato water give this bread wonderful flavor and texture. The dough is very soft and moist and might feel a little scary if you’ve never handled soft dough before. Once baked, the crumb is tender and airy, with tiny soft pieces of potato in it and a fine flecking of whole wheat. The loaves have a fabulous crisp texture on the outside and a slightly flat-topped shape. They make great toast and tender, yet strong, sliced bread for sandwiches. The dinner rolls are soft and inviting, and the focaccia is memorable. 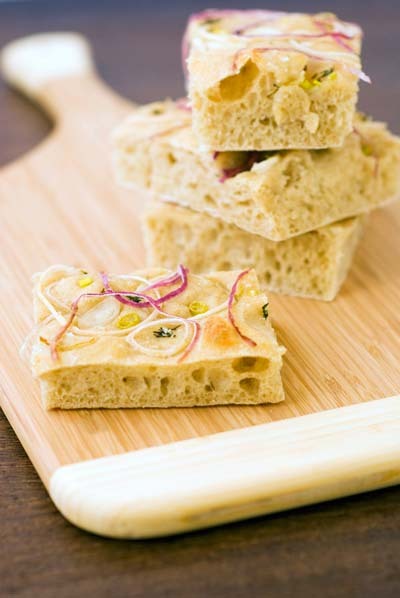 If making focaccia, just before baking, dimple the bread all over again with your fingertips. Leaving it on the paper, transfer to the hot baking stone, tiles or baking sheet. Bake until golden, about 10 minutes. Transfer to a rack (remove paper) and let cool at least 10 minutes before serving. 1 oz/ 1 Tablespoon of fresh yeast = 0.4 oz/ 1.25 teaspoon active or instant dry yeast = 0.33 oz / 1 teaspoon instant or rapid rise (bread machine) yeast (this recipe requires 1.6 teaspoons rapid rise yeast if that's what you are using). Reference: Crust & Crumb by Peter Reinhart. Continuing my Donna Hay love fest, I’ve been pouring through recent magazines, flagging recipes I want to try, and cooking them when I can. Recently, the magazine featured spoon-sized desserts – a very sweet (pun intended) set of recipes oriented around baking desserts in different types of spoons. There were several I was interested in trying, among them a very simple recipe for madeleines that can be baked in teaspoons or tablespoons. The cake recipe contains only a few ingredients and is quickly whipped up. The challenge for me was finding appropriate spoons. My modern, sleek stainless steel spoons did not seem worthy of such a pretty dessert and I don’t own silver flatware. This led to my adventure – a trip to a prop rental company. Coincidentally, I live in an area of New York City that is full of photography, theatre and film-related businesses. There are several prop rental companies in the neighborhood, including Prop Haus, a store without a street front that operates largely on word of mouth (no website and hardy any detailed information to be found without visiting). They have two floors, a complete floor of kitchenware and tabletop items and another full of furniture, and they rent items for photo shoots and movies. 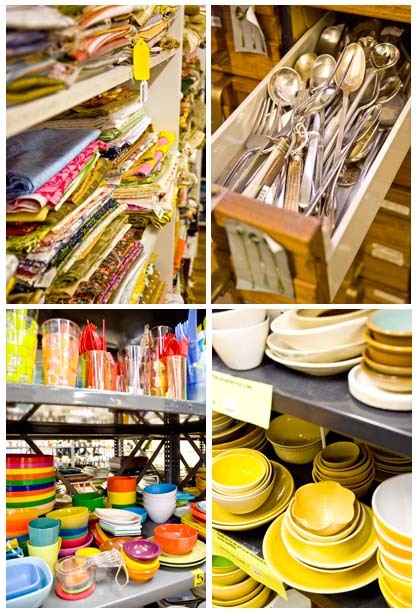 To my delight, stacked on high shelves, row after row, were any type, style and color of plate, silverware, table linens, glassware, and cookware I could possibly imagine. 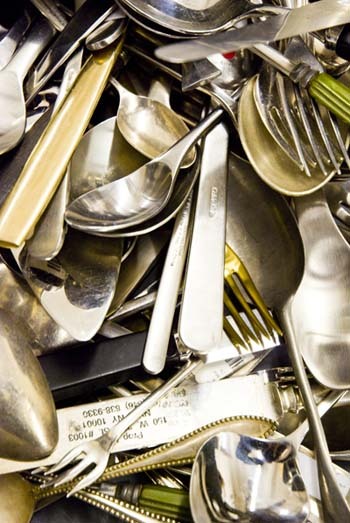 There was a chest of drawers filled with silverware, antique and new, classified by type, available for the picking. I had a hard time walking out without more items. The price, unfortunately, was a deterrent for the hobbyist like me – antique silver aside, given the prices and the one week rental period, it is more cost-effective to continue to buy props here and there as I need them. For this project, however, I had a wonderful time combing through silverware to find the perfect mismatched assortment of tarnished antique spoons, and of course, I couldn’t help but check out everything else as well! It is truly heaven for the design, photography or food enthusiast. I had a nice experience that came from a kitchen quest earlier this week. I have been looking for a prettier and less expected alternative to conventional ramekins that would make a prettier presentation at the table and think I’ve finally found my answer in Mud Australia baby noodle bowls. I searched for the color and quantity I wanted online and happened to call a store in Maryland that carries the brand. After giving my order information, the store owner realized we had gone to high school together. She has beautiful store as a second career after being a lawyer. It’s always wonderful to rediscover people, and to find people who are following their passion – very encouraging for someone like me who is just starting her own business. To check the store out, click here. Preheat oven to 355°F. 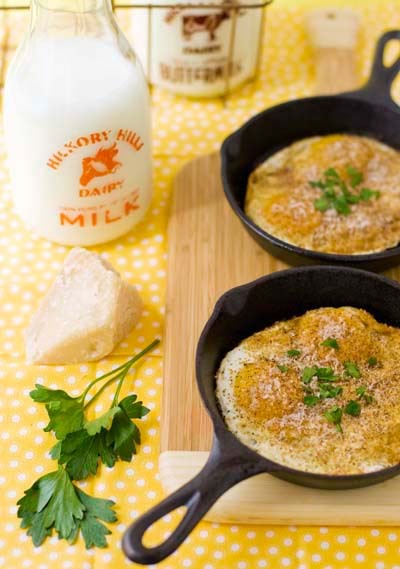 Place eggs and caster sugar in a small bowl and whisk to combine. Fold through the flour, baking powder, cocoa powder and butter. Place ~30 greased teaspoons or ~15 greased tablespoons around the edge of a rimmed baking sheet. Spoon the mixture into the spoons until 2/3 full. 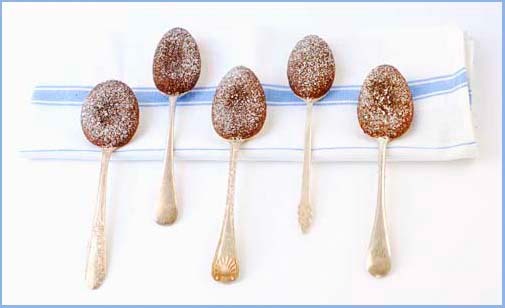 Bake the teaspoons for 5 mintues or the tablespoons for 8 minutes or until madeleines are cooked. Dust with confectioner's sugar to serve. I never considered making my own cheese, after all, people focus their lives on cheese making and it is easy to buy wonderful cheeses. But then I saw how simple it is to make fresh ricotta. 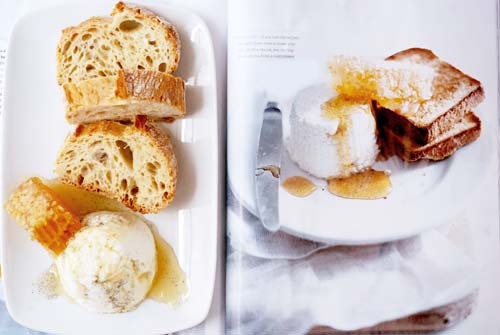 Donna Hay had a wonderful piece on ricotta in the October/November issue (my dish above left, her magazine page on the right) and I was very curious to see if a recipe that simple, for something I had previously thought was very complicated, would actually work. Believe-it-or-not, two ingredients later (milk and vinegar), and about 10 minutes total cooking time later, I had a soft and fluffy ricotta that was so fresh and satisfying I couldn’t believe I’d never tried it before! The only piece of specialty equipment required is a liquid thermometer. Otherwise, it is optimal to use a ricotta mold, but the recipe works perfectly well molded in any 1-cup capacity container provided you drain the ricotta well before loading it in and use care when un-molding. Ricotta molds are not the easiest things to find, and after realizing I would have to resort to mail order, I decided it wasn’t that important. 1. Place the milk and a candy thermometer in a saucepan over medium heat and heat to 176ºF. Remove from the heat, add the vinegar and allow to sit for 5 minutes or until curds form. 3. Spoon the ricotta into a glass or ceramic dish and loosely cover with plastic wrap. Store in refrigerator for up to 1 week. Makes 1 ¼ cups. *The reason the curds need to be carefully spooned is to ensure they hold their shape. Pouring the curds straight into the colander will result in the cheese becoming dry and grainy. Place the water, honey, vanilla bean and seeds in a small saucepan over medium heat and stir to combine. Bring to a boil and cook for 12-15 minutes or until thick and syrupy. Strain and allow to cool. Turn ricotta out onto a plate, pour the honey syrup over it and serve wit the honeycomb and brioche.